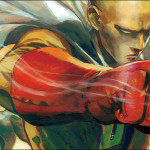 One Punch Man has earned a feverish cult following in the aftermath of its critical and commercial success since 2015. This latest release from Madman brings together the full TV series and the OVAs into a single package, so now seems as good an opportunity as any dive in to see what all the hype is about. In the not-so-distant future mankind (or at least Japan) have become subject to random, violent encounters with mythological beasts, post-modern monsters and extra terrestrial dictators. To combat this growing threat, humanity has established the Hero Association to enlist the help of everyday citizens with real (or imaginary) super powers to help keep everyone safe. Enter Saitama, the One Punch Man who does heroic stuff because it’s fun. After training his body to such extreme lengths as to leave him bald, he’s made it his mission to exterminate violent threats in the pursuit of finding a challange, as well as paying bargain prices at the supermarket for his weekly staples. 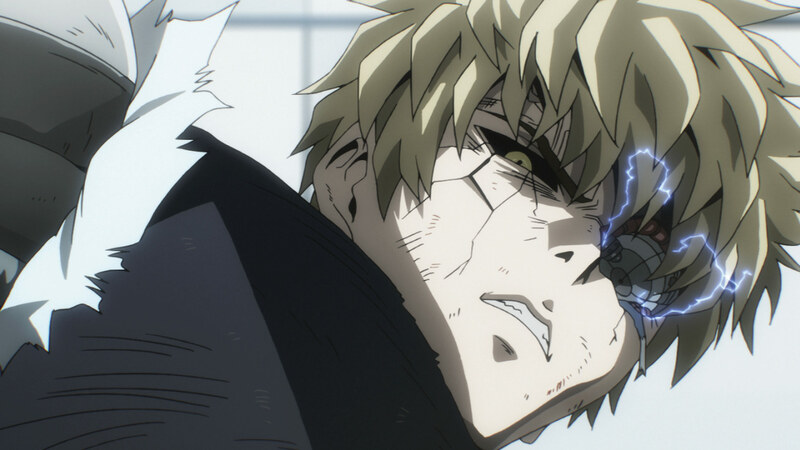 Together with his surprise cyborg/student Genos, he vows to save humanity one punch at a time. Despite being the standard 12 episodes in length, that one paragraph pretty much sums up the whole series. One Punch Man delightfully eschews complex narratives by reducing everything down to Saitama smashing something with one punch. Demon super gorilla causing an urban disturbance? Smash. Underwater demon king? Smash. And so it goes. The action sequences are complemented by slice of life scenes with Saitama and later Genos, with some bordering on the absolute mundane (bargain hunting at discount supermarkets) and others pandering the usual action/shounen paradigm like training sequences. 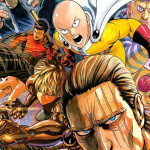 The extended cast also create some interesting points of flexion, especially once we get into the Hero Academy part of the story where Saitama discovers his interest in becoming a hero is something he could generate an income from, as opposed to living off cup noodles and punching enemies for a challenge. 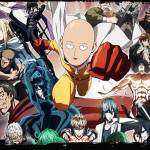 To its credit, smashing stuff in One Punch Man does look rather spectacular – the climactic multi-part conclusion is possibly one of the best action-based endings to have come out of Japan in years – but unusually its greatest strength is its oddball cast and the subversive sense of humour the whole production has. There are all sorts of archetypes and not-so-gentle tips of the hat to other anime that have influenced things. Saitama’s ability to coolly one-punch any disaster smacks of Rurouni Kenshin, the ridiculous power-up sequences are Dragon Ball Z through and through and the cycle of villains of the week with a penchant for unnecessary exposition is straight out of every weekly action TV series. It’s entirely self-aware, and Saitama’s dead-pan performance is absolutely spot-on. The hero concept was also quite interesting. Again, One Punch Man picks and chooses archetypes but still manages to get the sense of humour or action spot-on. Prisoner’s stereotypical characterisation is completely obliterated by creating complexity through combining someone with genuine warmth and physicality that overcomes the fact his ultimate power up is getting naked to protect the city and the guys he has crushes on. Silver Fang is all old man washi/ja but fights like a beast, while Mumen Rider rises above his fan club and his own inadequacies as a well-meaning but physically-inept aspiring hero to steal the show with countless acts of bravery that absolutely endears you to him. Then there’s Saitama’s self-appointed disciple Genos, a marvel of cybernetic technology and impervious morality, who never fails to aspire to be as great a man as Saitama (even though Saitama’s far from a perfect role model). 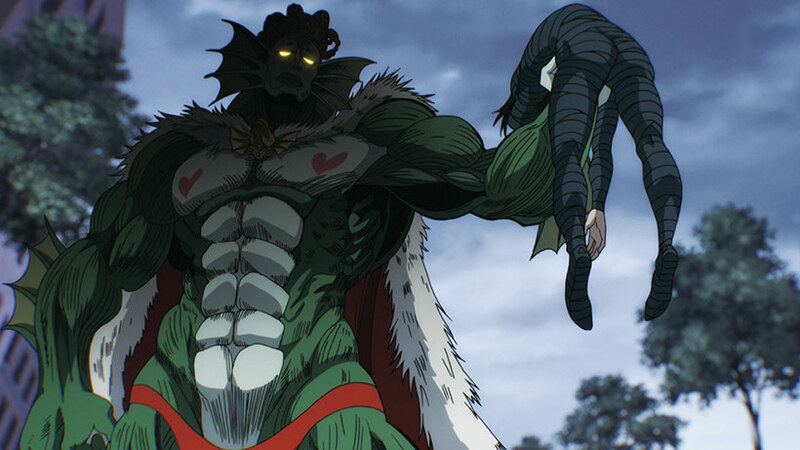 One Punch Man’s narrative generally takes a back seat by providing monsters of the week rather than an epic and sprawling story, but it does so with a sense of confident parody and satire. In some ways it actually reminded me a bit of Space Dandy, but it manages to consistently engage in every episode. The stories that roll over multiple episodes allow the series to stretch its proverbial legs, and while nothing in here is terribly ground-breaking it is absolutely entertaining. 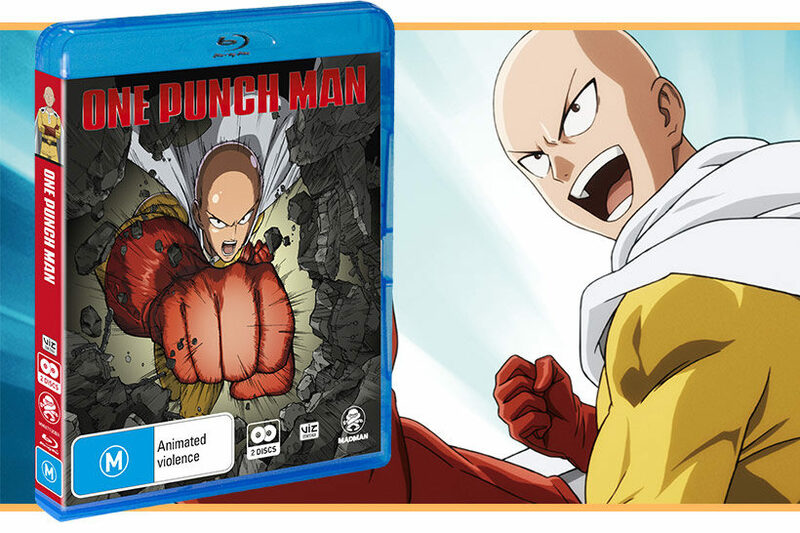 Thus the story, characters and presentation all come out swinging, and it’s great to see the actual Blu-Ray package for One Punch Man backing this up. The encoding looks great and as a bilingual release it covers off both camps. What sets this apart from many releases is the raft of excellent supplementary material. We have the usual ops/eds, but there’s a short featurette interview Saitama’s seiyuu and the director alongside the core cast of the English dub and, critically, all six OVAs are included which provide some great stories featuring Genos and other secondary characters. Coming in at around 10 minutes per episode, this rounds out an already impressive package given the fantastic production values for the main TV series itself. 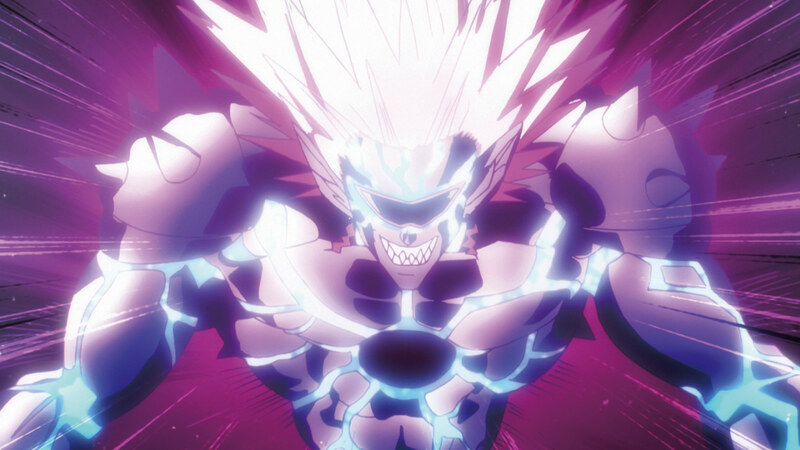 One Punch Man is an absolute cracking anime, and the excellent Blu-Ray package does all the right things that make this essential viewing. The graphic violence may be a little hyperbolic, but the underlying sense of humour, characters and self-awareness lend this anime an unusual strength. The second season will hit in 2018 and I can’t wait to see what comes next. 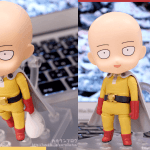 One Punch Man Goes Chibi with Nendoroid Saitama!